Talk of a new bridge to the Outer Harbor intensified several years ago when development ideas for the waterfront included housing and cultural attractions. But as the vision for the Outer Harbor has turned more nature-based and recreational, talk has died down about how to bring vehicles, pedestrians and bikes from downtown to the waterfront land. So is the idea of a new bridge dead? Not yet. But any chance for such a bridge now seems tied to finding alternatives to the aging Skyway. U.S. Rep. Brian Higgins and State Sen. Tim Kennedy have called for replacing the Skyway and want a new Outer Harbor bridge to be part of a state Department of Transportation study. "Everything should be looked at in the DOT study, including a bridge," said Higgins, D-Buffalo. "If not, then what's the benefit of the study?" Kennedy also said the study should look at more than a bridge. "I think it's important that the study be comprehensive in nature and looks at all alternative modes of transportation," said Kennedy, who now chairs the Senate's Transportation, Infrastructure and Capital Investment Committee. Despite what they say, a DOT spokesman said it's too early to know whether a bridge will be part of its Skyway study. The study, which started in September, could take up to two years to complete. Then a more thorough examination of the benefits and costs of each alternative would follow. 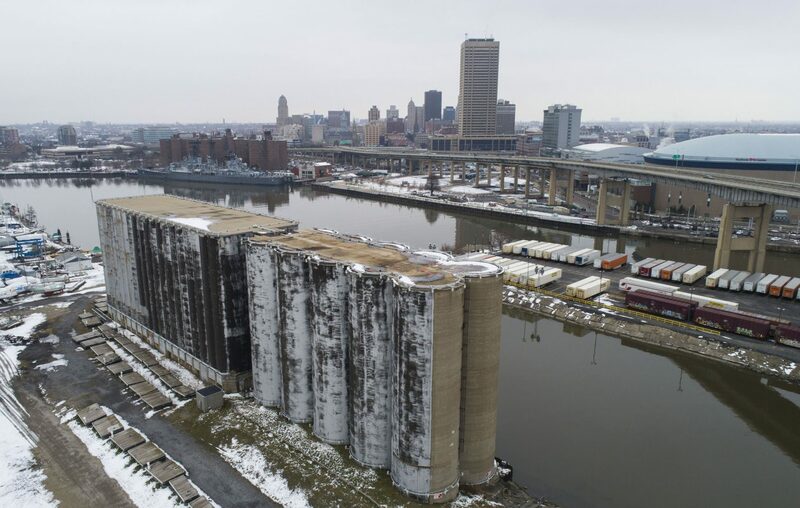 "The ongoing planning study will identify the needs of the corridor as well as feasible options to address those future needs, including potential ways to get to the Outer Harbor," said Joseph Morrison, the DOT spokesman. "While a new crossing of the Buffalo River may be included as an option ... it is too early to speculate," he said. The idea of a bridge to the Outer Harbor gained traction 10 years ago. Erie Canal Harbor Development Corp., a state agency, launched the Buffalo Harbor Bridge Study in April 2009. Agency officials believed that infrastructure was needed to connect downtown to the Outer Harbor. A bridge would shepherd pedestrians, motorists and cyclists and maybe even leave room for light rail. The expectation of substantial development coming to the Outer Harbor -- including neighborhoods and cultural attractions -- influenced their thinking. Higgins and others also saw a new bridge as an opportunity to dismantle the Skyway. The waterfront agency held public outreach sessions in summer 2011. Fixed and movable bridges were considered. So, too, was a tunnel, a water ferry with cars and even a gondola. One idea had the bridge cutting through the Connecting Terminal, the grain elevator now used as a giant projection screen for nightly light shows. Eventually, a drawbridge emerged as the preferred alternative. The foot of Main Street or Erie Street were considered the most viable locations. Building a bridge where Michigan Street meets the Buffalo River – the shortest distance and least expensive option – was taken off the table because of its potential impact on the General Mills plant. Work began on the environmental review process in October 2012, but nothing was ever submitted to the state Department of Transportation. Erie Canal Harbor Development took ownership of the Outer Harbor from the Niagara Frontier Transportation Authority in 2013, and its decision to put housing there was scuttled after public resistance, leading to an emphasis on open space rather than dense activity. The federal Environmental Protection Agency and the state DOT, meanwhile, indicated low traffic projections made a bridge to the Outer Harbor, with its roughly $100 million price tag, a poor candidate for government funding. Converting Ohio Street into a cycling-attractive roadway to the Outer Harbor – something Higgins and the waterfront agency helped bring about – also lessened the need for a bridge. So did the introduction of a seasonal bike ferry. The dormant bridge idea could spring back to life if it's part of a larger transportation solution to the Skyway. While an Outer Harbor bridge no longer makes sense as a standalone project, it could as part of a comprehensive plan. In May 2016, Higgins and Kennedy called for an assessment of the Skyway's removal and a comprehensive review of alternatives to the elevated highway. Then-DOT Commissioner Matthew Driscoll wrote that July that the department would "commence [the study] for the Skyway and surrounding transportation corridors during the current State Transportation Plan period." That period extended through March 2020, resulting in a 2-year, 2-month wait before the plan got underway this past fall. The study will determine the long-term viability of the Skyway and look at a number of alternative options if it is taken down. The options include upgrading roads and an Outer Harbor bridge to accommodate rerouted traffic. In the meantime, the DOT is spending around $30 million on a major Skyway deck rehabilitation, maintenance and painting program. Work on the eastbound side finished last year. The westbound work is expected to be completed in 2020. A DOT study in 2008 concluded extending the useful life of the elevated highway, built in 1956, would cost between $109.2 million and $124.9 million. 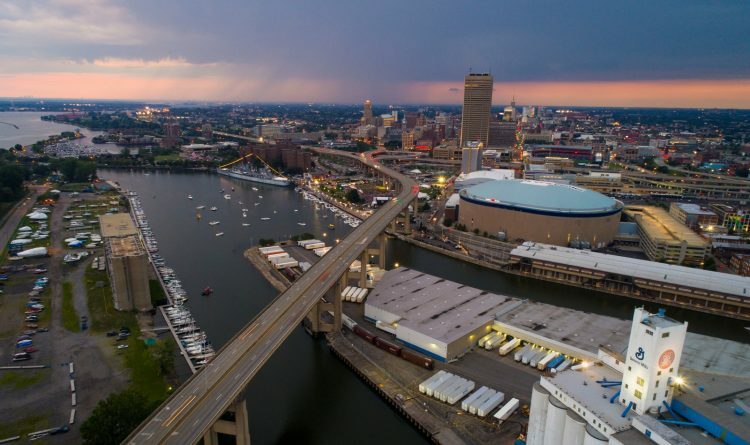 "We want to position Buffalo to make a smart decision about its future transportation needs," said Higgins, who has made removal of the Skyway one of his signature issues. "Right now there are no alternatives to the Skyway, which is functionally obsolete, structurally deficient and fracture critical," he said. "It is an unsafe bridge that has outlived its usefulness in the city." Higgins found encouragement in how Rochester removed elevated sections of highway and by how Syracuse plans a similar project. He wants that to happen in Buffalo, too. Higgins, however, worries the Skyway study is not far enough along to be eligible for federal funding from a $1 trillion infrastructure bill he believes may pass in Congress in the next year or two. It's why Higgins has urged the DOT to speed up its study. "This year could see the first major infrastructure investment in two decades," Higgins said. "We just need to be prepared so we have alternatives from which to make a smart decision about Buffalo's transportation future. "I want to see federal money earmarked for a replacement for the Skyway, but right now we're not prepared," he said. The Skyway alternatives may not be far enough along to qualify for federal dollars that could be available, said Hal Morse, executive director of the Greater Buffalo-Niagara Regional Transportation Council, which sets transportation priorities. "It depends on what Congress does and how they want to structure that," Morse said. "If they say it's for shovel-ready projects, or if it's a stimulus-type of package that required start of construction immediately, then clearly not." But Congress could structure project readiness in other ways that leaves the door open for funding, such as only requiring a design phase to get underway within a short time frame, Morse said. The emphasis on open space and active and passive recreation has changed the outlook for the Outer Harbor. The Connecting Terminal grain elevator, where a bridge was once envisioned cutting through, is now being viewed as a potential visitor center for a relocated bike ferry. Putting a bridge on the Outer Harbor could face push back from some wary of its impact on the relatively tranquil setting. Jay Burney, an environmentalist who co-founded Our Outer Harbor Coalition, said he's not sure a bridge to the Outer Harbor is needed. "We have pretty good access now for the uses we are envisioning," Burney said. "It's limited, but that's OK."
Burney said his attitude toward a bridge to the Outer Harbor would depend on what was envisioned. "The devil is in the details, and where the bridge would land would be critical," Burney said. "I would imagine there would have to be a whole lot of public dialogue around the issue, but it's not automatically a non-starter," he said.